Hardcover, 48 pages, 17.0 x 15.5 cm, 6.7 x 6.1 in. 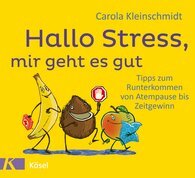 Carola Kleinschmidt, an expert in stress resilience, provides a cornucopia filled with helpful tips for stressful times. Every fruit in the basket stands for a specific strategy. The apple reminds us to breathe deeply. The lemon points out that stress is not a punishment but rather an opportunity. The melon asks whether all this is really so hard, and the grapes will prevent us from getting tangled up in multitasking. With the help of these fruity tricks, even when things get messy or chaotic you will keep going instead of getting burned out – so that stress will not generate even more stress.